The San Francisco Zoo’s newest resident is a 3,700 male hippopotamus that arrived from the Topeka Zoo on Wednesday evening, January 5 and made his press debut on Friday. Last August, the male hippo, named “Tucker” in Topeka, and his mate welcomed a new son at the Topeka Zoo. But three hippos require quite a bit of room so the search began for a new home for the 8 year old adult male. The San Francisco Zoo hasn’t had a hippo since “Mama Cuddles,” its 46-year-old female Nile Hippo died three years ago. 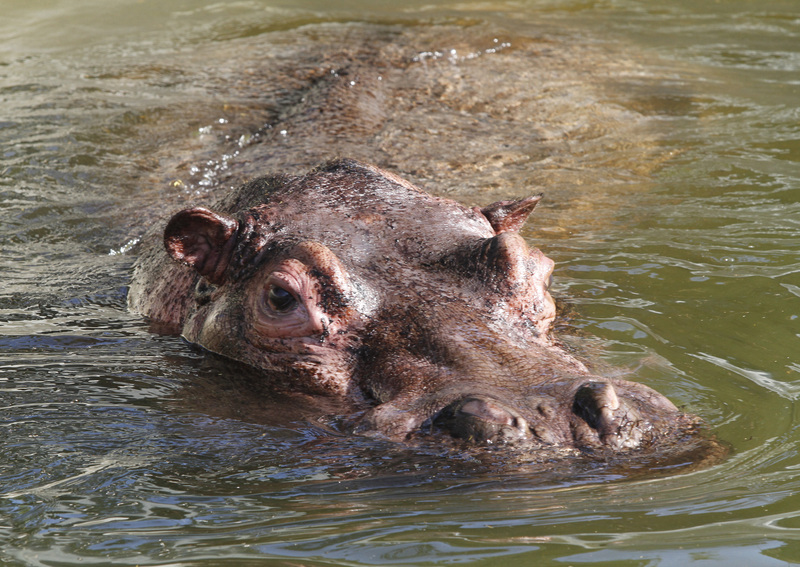 After she passed, the zoo began a massive renovation of the hippo exhibit to create a pool three times larger and with a new dry land pasture area. With a newly renovated space, operation hippo transfer began. Federal Express donated the shipment of the 3,700 pound hippo, and the San Francisco Department of Public Works transported him to the Zoo. The hippo’s public access will be limited until he adjusts to his new home. At its annual fundraiser on April 29, the Zoological Society will seek “parents” for the hippo who will have the honor of bestowing him with a name. The San Francisco Zoo has no plans to breed the new hippo and reported that he will not be sharing his space with any other hippos either. While hippos live in large groups called “pods,” they are not social animals and sometimes become aggressive. Tucker, however, so far appears to be very mild-mannered. The zoo also reported that it is unlikely that Tucker will miss his previous mate or offspring. In the wild, hippos breed and then go back to their day-to-day activites in the pod. The male has no interaction with its offspring. The San Francisco Zoo’s former hippos, Puddles and Cuddles became acclimated to each other over a long period of time. The hippopotamus, whose hide alone can weigh half a ton, can reach up to 3.5 tons in weight and is the third-largest living land mammal, after elephants and white rhinos. It can reach 13 feet long and 5 feet tall and has a lifespan of about 50 years. It was considered a female deity of pregnancy in ancient Egypt, but in modern times is no longer found in Egypt because of the damage it inflicts on crops. The hippo thrives in other parts of Africa. Hippos move easily in water, either swimming by kicking their hind legs or walking on the bottom. They are well-adapted to their aquatic life, with small ears, eyes and nostrils set at the top of the head. These senses are so keen that even submerged in water, the hippo is alert to its surroundings. By closing its ears and nostrils, the adult can stay under water for as long as six minutes. The zoo’s new hippo has taken to his large new pool like a fish to water. About the San Francisco Zoo Encompassing 100 acres, the historic San Francisco Zoo is Northern California’s largest zoological park. The Zoo is home to exotic and rescued animals from all over the world and is located across from the Pacific Ocean. Winter Hours through March 12, 2011: The Zoo is open daily from 10:00 a.m. to 4:00 p.m. (last entry at 3:30 p.m.) and is located at 1 Zoo Road, San Francisco. Tickets: from free to $15.00. Phone (415) 753-7080 or visit http://www.sfzoo.org for more information.